The Karlskirche or St. Charles’ Church in Vienna is one of the most famous architectural monuments in the city of Vienna. After the last great Viennese plague epidemic in 1713, praised by Emperor Charles VI as a church for the patron saint of the name and plague saint Charles Borromeo, the Karlskirche was built in the first half of the 18th century. With its dome and two flanking relief columns, it dominates the Karlsplatz, which has been restored as an ensemble since the end of the 1980s. One of the great attractions of the St. Charles’ Church inside are the frescoes in the dome at a height of about 40m, which are accessible via a panoramic elevator. The church elevator, which was installed during the dome fresco renovation in 2002, is still an important source of income today. 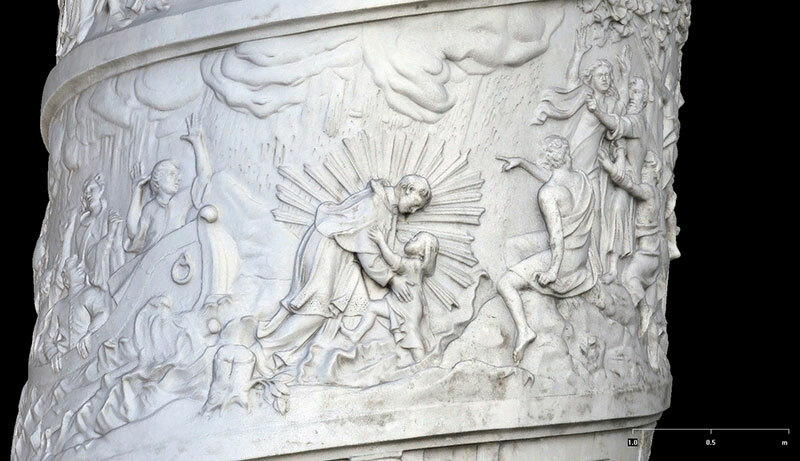 The visitors of the Karlskirche describe the elevator however very ambivalent, on the one hand unique because of the possibility to take a close look at the dome frescoes, on the other hand strongly impairing the interior impression of course. 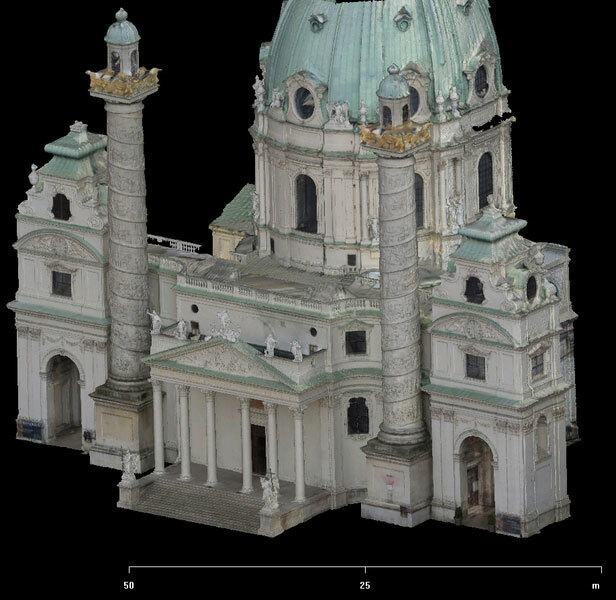 The Karlskirche-Verein therefore initiated a pilot project in 2016, which was to create an alternative access to the church and a special new attraction for visitors via modern 3D surveying and “Virtual Reality” (VR). 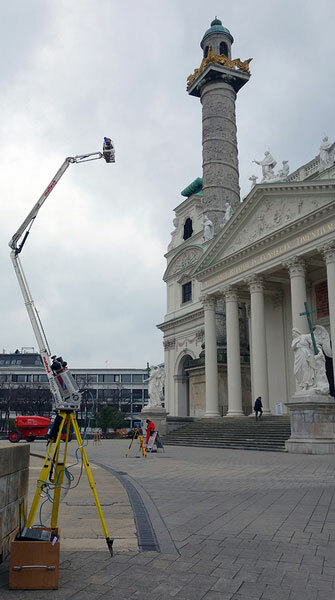 As part of a first exemplary 3D photograph, ArcTron 3D was able to digitize large parts of the Karlskirche in three dimensions using a combination of terrestrial laser scanning and high-resolution 3D photogrammetry, including sub-millimeter laser scanning technology. The large quantities of surveying data were fused in a complex process into highly accurate 3D data and processed into photorealistic 3D models, especially for the façade and the two relief columns. These were then transferred into a VR real-time environment. The VR application was realized with our cooperation partner, the Viennese 3D media company 7reasons, which is also particularly predestined as a Vienna and Karlsplatz specialist for this project. As a new attraction for the visitors of the Karlskirche, a virtual flight around the Karlskirche was realized, which allows not only audio information but also an immersive “flight” to and around the St. Charles’ Church as well as a closer look at the motifs of the two relief columns, which are dedicated to the life and work of St. Charles Borromeo. The results of this pilot project are currently being evaluated. Further possible steps towards digitalisation and didactic communication of the history, art history and extensive image programme of the Karlskirche are to be initiated. 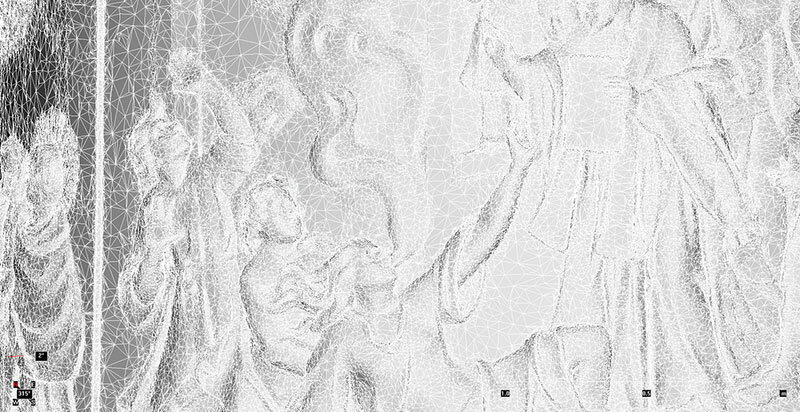 A virtual tour with a visit to the dome frescoes would be one of the alternatives considered if the panorama elevator inside were to be dismantled after all.